Kickstarter is the king of crowdfunding sites, and getting fully funded on it with a crowdfunding video attracts the attention of the press and makes it easier to get your product into stores. Therefore, there is a lot resting on creating the best campaign possible. Quite simply, text can only do so much when it comes to convincing someone to buy. As the saying goes “seeing is believing”. There are several video creation agencies; however, it can be very expensive. Moreover, some of them produce videos which don’t match up to the cost. It is possible to create an effective video as part of your Kickstarter marketing campaign and get fully funded. Let me break down exactly how to do that. Most people underestimate the time it takes to create an effective crowdfunding video. As a result, this can lead to an end product which isn’t up to scratch. All the highly successful Kickstarter marketing campaign videos have common traits. Plus, my experience consulting with entrepreneurs and getting them fully funded has given me extra insight into what works. Backers need to imagine using the product on a day-to-day basis. Therefore, CGI animations or pictures of the concept/product aren’t enough. You need to communicate the positive impact it will have on their life and those around them. If your product is a concept, it is worth creating a prototype or dummy model for the video. Backers come from all walks of life. Therefore, you need to be able to show that your product can be of benefit to a range of people and show that in your video. This is an effective way of attracting the attention of influencers and catapulting your campaign to the next level. 1) An emotional event which made you design the product. 2) The benefits of the product. 3) How the product can evolve. 4) How backing the product would help millions of other people. The aim is always to create a video which people want to share and the press want to write about. As a result, it needs to be as short and engaging as possible. The best way of doing this is to draft out a script and then keep redrafting in order to make it more succinct and get to the “juice”. People bounce quickly through the Kickstarter website. If your product takes paragraphs to explain, they will quickly lose interest. Summarise your campaign into a sentence and have that as the title of the description. Ideally, this should also transmit the major benefit of your product. This would enable you to “hook” potential backers so that they want to find out more. I consulted for SilentKeys and they raised more than $100,000 or 220%. Their main image was shared on social media and by the press. This is because it simply said “Privacy at the touch of a button” with a hand on a keyboard. This simple sentence transmitted the main advantage of the product and a sense of simplicity. You can save a lot of money and time on the shoot of your video by following some simple guidelines. When recording a professional standard video, multiple locations increase costs. This is because people have to be transported, and this adds significant costs. Therefore, it is worth booking some time in a photography studio to shoot your ad. This ensures that you have a professional setting and everyone stays in one place. In fact, you could still get the benefits of a green screen with can give the illusion of multiple locations in post-production. Time is money. Don’t just come with a script, but have storyboards so that you know exactly what needs to get done. The more detailed you are with the planning, the quicker the crowdfunding video gets shot and the better it is likely to be. One trick is to visit a university and ask to use final year film production students for a video project This is because they are keen to build a portfolio prior to graduation, and you can get a good deal on their services. Moreover, most universities allow their students to borrow top of the range equipment and use studios as part of their tuition. Make sure that you check out some of their past videos so that you have a good idea of their style. As final year students, they are likely to have some. Referring back to my point about show how your product can be used by a range of people, it is worth enlisting the help of friends and family to participate in your crowdfunding video. They can be shown in the background in order to add to the realism of the video. If you are unable to do this, visit a university and request drama students for a paid project. This would enable you to get good actors for your video, and raise its’ standard of professionalism. 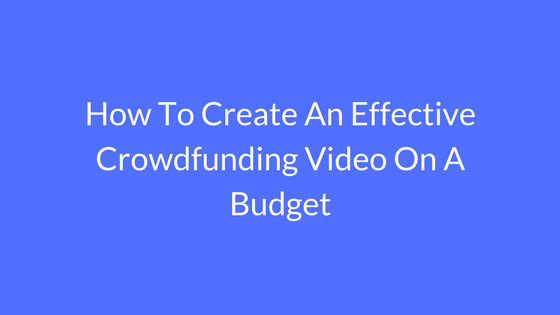 In conclusion, I hope you found this post on how to set up a crowdfunding video without breaking the bank useful. I am a Kickstarter marketing consultant with many fully funded projects under my belt and happy clients. What I love about being a consultant for crowdfunding campaigns is that I get to see my advice and marketing execution have a direct impact on the number of backers a project has. There is nowhere to hide. The results speak for themselves. If you would like to leverage my knowledge and experience for your Kickstarter project, feel free to get in touch.